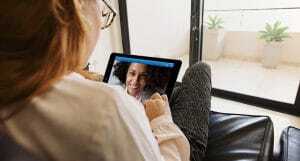 Telehealth is a healthcare-delivery method that connects patients with medical providers through everyday communication tools and purpose-built technology solutions. Patients can access medical care wherever they may be (ie. hospital, clinic, work, home, school, etc.) using their phone, computer or specailized devices in their doctor’s office, clinic or hospital. Telehealth is a broad field that includes both software and hardware-based medical approaches for urgent, tele-stroke and tele-psych treatment. Other disciplines also include physical therapy, home health, counseling, and consumer education. Asynchronous. A static messaging service that enables email and text messages to be delivered securely between patients and providers. The patient sends their chief complaint through email or text and the provider then has time to research and prepare a treatment plan for the patient. Or a provider captures information to be reviewed by care teams to prepare a diagnosis and treatment plan. Synchronous. 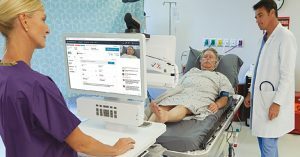 A real-time communications service that enables phone or video conferencing between patients and providers. A patient and provider can connect with a face-to-face without having to be in the same physical location. Scheduled and Unscheduled Communication — Synchronous solutions can provide patients with the option to access a provider at their time of need through unscheduled 24/7 on-demand care. Or, virtual visits can be scheduled on the patient’s terms with the visit time and provider that works best for them. Avizia’s Anytime Virtual Clinic offers a synchronous software solution to health systems that wish to extend their practice outside the four walls of a hospital or clinic with video and telephone conferencing. Avizia’s software is white-lableled, ensuring the virtual clinic is a natural extension of the health system’s brand, mission, and service. The goal is to connect consumers to their trusted providers. 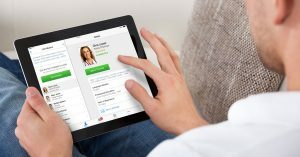 The configurable implementation process, which includes clinical and business workflows and design, allows health systems to launch a virtual clinic platform that meets the needs of their unique market in as little as 60 days. Integrated telehealth is not an automated service or a healthcare algorithm. It is technology that enables real-time communication between a patient and a live provider. Prioritizing customer experience. Patients have control of their healthcare with the ability to request care 24/7/365 online or over the phone. Patient concierge staff guide patients through the phone intake process and can re-direct patients to in-person care in the event of an emergency. Flexible staffing. Hybrid clinical staffing allows health-system providers to see patients virtually and enlist support from Avizia-employed providers during after-hours or at peak utilization times. High quality care and integration. Clinical and business workflows, designed by the health system, along with Avizia’s Virtual Practice Guidelines (VPGs) support the entire virtual visit process to effectively treat patients and determine whether a diagnosis can safely be made in a virtual setting. Seamless integration allows the virtual clinic to be securely embedded in a health system’s operations giving providers the ability to push and pull patient data and operate all visits based on a health system’s standards.